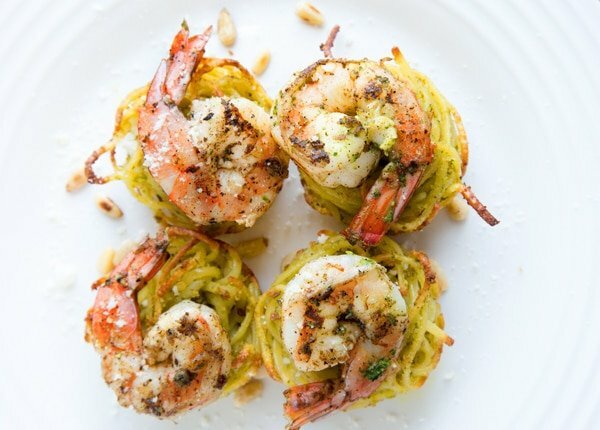 Whether you serve this for dinner or as an appetizer, my Pasta Nests with Pan Seared Shrimp will definitely be a head turner. The unique presentation and delightful flavors will be all your guests will talk about. With the holidays rapidly approaching it’s not too early to start thinking about dishes to make your holiday gatherings more delicious! Everyone of us becomes an event planner when the holiday season starts and whether it’s a cocktail party, dinner or even a brunch, my Pasta Nests with Shrimp will leave a lasting impression. 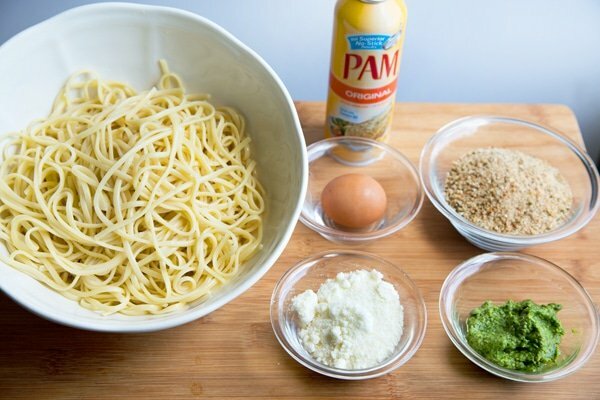 Let’s start by getting our ingredients ready to make the Pasta Nests. Everything can go together in the same bowl. I found adding a little extra olive oil to the pasta helped keep it moister. Just add about 2 tablespoons of olive oil in as you blend all the ingredients. I used a cupcake size tin and sprayed the tin liberally with PAM Original Cooking Spray. 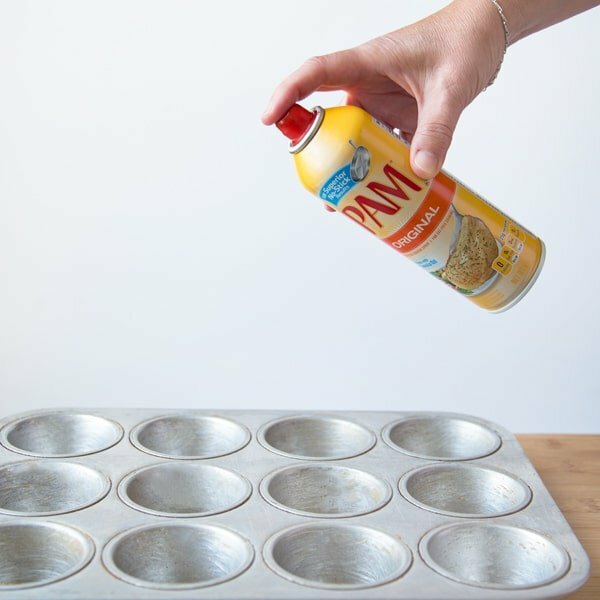 PAM Cooking Spray leaves *99% less residue than margarine or bargain-brand cooking sprays do. (*vs. leading cooking sprays (except olive oil), after spraying on glass bakeware, baking at 400°F for 30 min, cooling, and then washing in standard home dishwasher with detergent and repeating 4 times). After making your pesto, oxidation starts to take place darkening the top of your pesto, making it less visually attractive. Here’s a tip to keep it fresh and that beautiful shade of green until you need it. 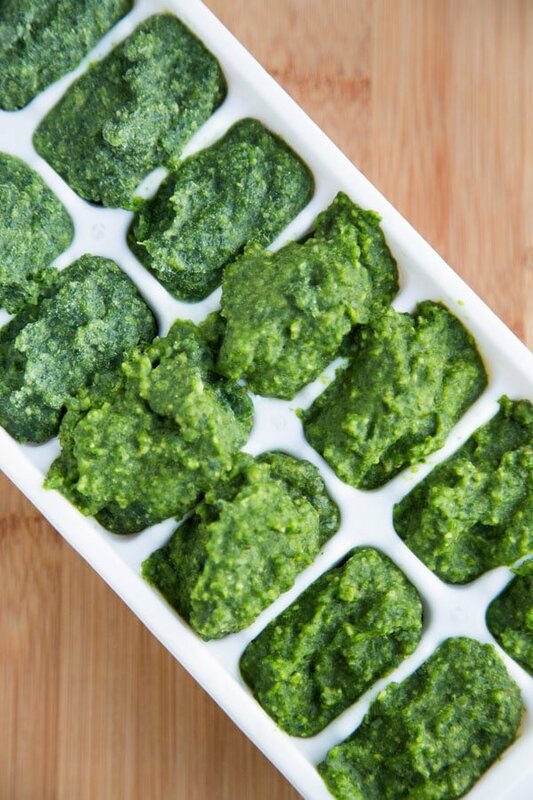 Spray an ice cube tray with PAM Original Cooking Spray, then divide your pesto among the cubes. 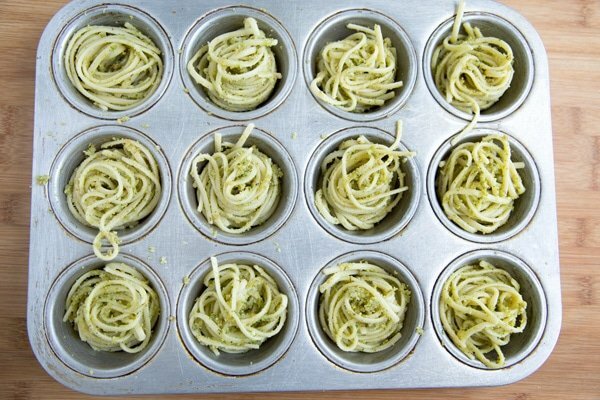 Freeze the pesto solid, then twist the tray and watch the pesto cubes pop right out of the tray! 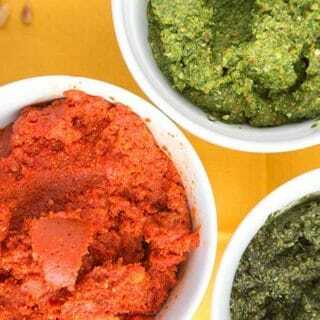 Place your pesto cubes in a zip-lock bag and keep them in the freezer until needed. 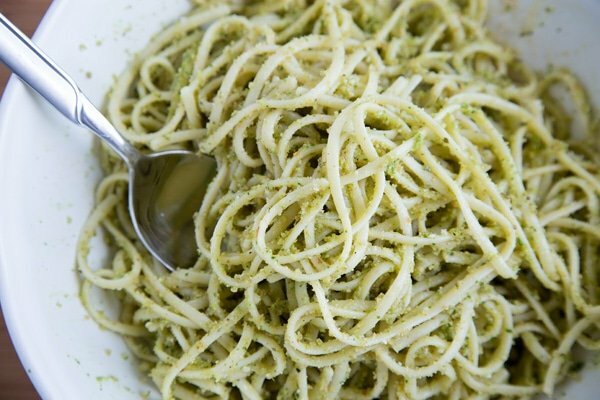 This way you’ll be able to enjoy adding pesto to your dishes whenever you want to enjoy that fresh taste of summer. 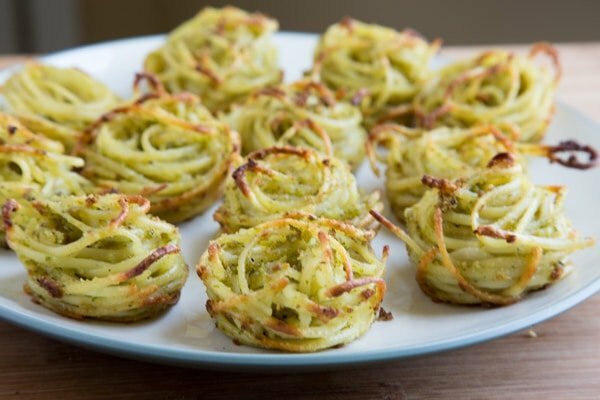 Now it’s time to have a little fun making your Pasta Nests. Grab a tablespoon and a fork and using the Twirl Method, build your nests. Gently place each nest into one of the cups in your pan, repeat the process until all of the cups have been filled with your pasta nests. Place the pan into a 425 degree preheated oven and bake for 10 minutes. 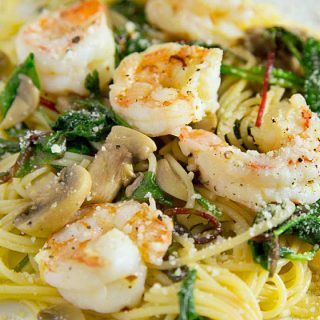 While your pasta nests are baking, it’s time to cook your shrimp. Of course you can do this ahead of time if you like, the shrimp do not have to be hot, room temperature is fine. Searing shrimp is easy to do. 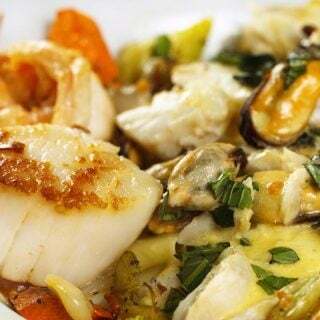 The easiest way to get great color and sear the shrimp is to use no oil in your pan. This is where PAM Original Cooking Spray helps out. Let your saute pan get good and hot, then give it a good spray of PAM adding your shrimp a few seconds afterwards. 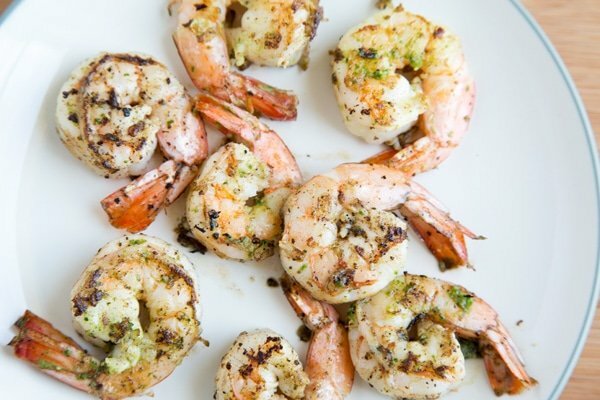 Now season your shrimp with your favorite seasonings. I used old bay, a pinch of crushed red pepper, a sprinkle of Romano cheese and as the shrimp were almost finished cooking a dab of pesto for color. Chopped parsley would have been a good addition instead of the pesto but I didn’t have any on hand. By cooking the shrimp this way, you start to get a little burn in the pan, which adds great color to the shrimp. They almost look grilled. Be careful not to overcook your shrimp. so they don’t get tough and chewy. Remove the pan from the oven and place the pan on a wire rack to help it cool off. After about 5 minutes begin gently removing each nest by placing a tablespoon underneath and lifting the nest out of the pan. Place the nests on a plate as they finish cooling. You’ll delight your guests, friends and family with these perfect little pasta nests and pan seared shrimp. And if you don’t want to use pasta, think about using zucchini noodles instead. One thing I found after making the first test of these Pasta Nests was that they needed to be over seasoned to have enough flavor, so don’t be afraid to add a little extra flavor in your mixture. 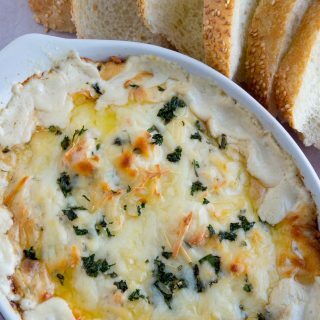 You may also want to add a little Gorgonzola cheese to the mix, or simply add it to the top of the nests before baking. If you’d like to plate these individually as an appetizer for a sit down dinner, think about using a larger muffin pan to give you more plate coverage. Just don’t build the nests too high. 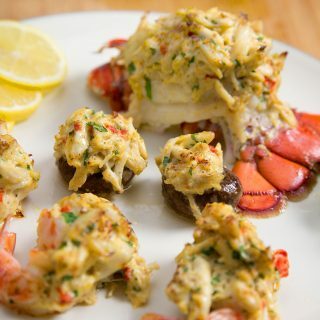 You could also serve these with a sauce of your choice if you plate them. But any way you make them, they’re a fun and delicious appetizer! 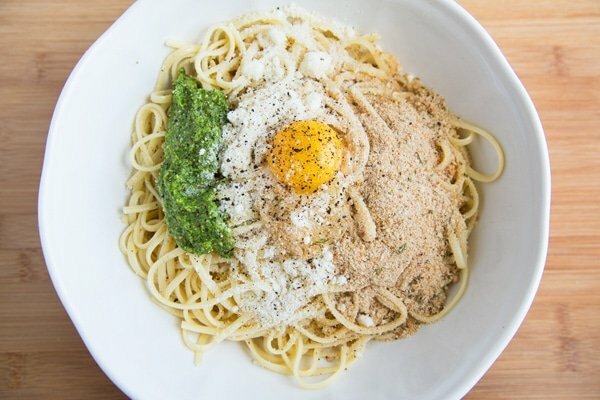 Add Romano cheese, bread crumbs, pesto, olive oil, egg, sea salt and black pepper to pasta. Mix well to completely coat pasta with ingredients. Place pan in preheated oven and bake for 10 minutes. Heat a large skillet with no oil in pan, keep it dry. Spray a good amount of PAM Original cooking spray into the pan and after 10 seconds add shrimp. 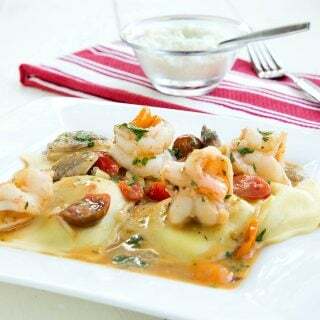 Season shrimp with old bay (or your favorite seasoning) a pinch of red pepper flakes and a little Romano cheese and continue to stir shrimp around in pan until they are fully cooked. Add a little bit of pesto to the pan at the end to help with the color, or add a little chopped parsley. Cooking in a dry pan, just using Pam will allow the shrimp to sear and the seasonings will give the shrimp flavor and color. Be careful not to overcook shrimp, but allow a little burn in the pan to give the shrimp that beautiful color. Gently remove each nest from the pan using a tablespoon by sliding it under the nest and lifting it out. Place nests on serving tray. Top each nest with a good sprinkle of Romano Cheese, then the seared shrimp.